So cute! love this and I want to CASE for a friend who likes anything nautical! Sorry you get so sick.... I did the first cruise.. coke and saltine crackers worked for me. Linda I truly feel your pain. lthough I do not get car sick both my husband & Beth get carsick - no back seat for either of them! Your card is adorable and the perfect way to watch the sea! 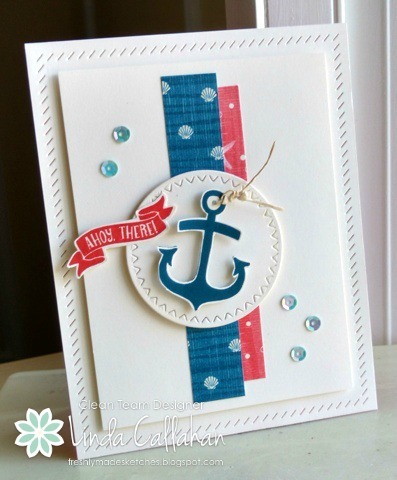 This is such a fun nautical card, Linda! That anchor is such a cool look against the white. Perfectly clean, crisp, and adorable! Those stitched edges and sequins are the perfect finishing touches. Anchors away my friend! The beach is a wonderful way to enjoy the ocean - you get all the benefits without the seaweed or the salty crust in your hair. Love your homage to all things nautical! I'm totally with you on the ocean from the beach!!!! This is so sweet, Linda! Enjoy that last ocean air on your vacation!! This is such a great card Linda! I love the nautical theme and that big anchor! Oh, I love the stitched circle too..and the sequins, and the sentiment!!! I get sick on the ocean too. I don't know how those guys on Deadliest Catch do it. It makes me cringe just watching!! This card is fabulous! I love the colors! 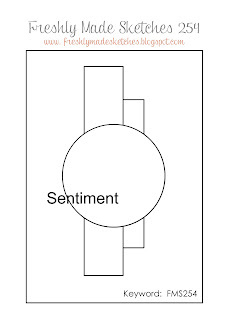 So much awesome white space too. Oh I love, love, love this card! I love your choice of image mixed with those fab colours and smattering of sequins. The textured border is a wonderful touch too!